A Digimon which takes on the form of a shellfish covered in two sets of hard scales. 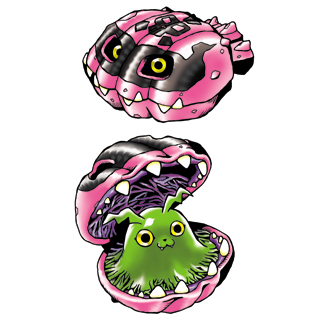 Because he has developed the encrusted shell-like scales drastically, his internal structure and body is slime-shaped and is the size of an In-Training Digimon. This dirty guy entices the opponent with his cute face, then attacks. In addition, once his scales are closed up, his attack and defense are raised a little higher, making oncoming attacks bounce off of him easily. His special attacks are "Water Screw", which shoots out a super-flowing current of water at the enemy, and "Black Pearl", which fires out a jadeite generated in his body at the opponent.